Summertime is here and many families ask for ideas on activities that they can provide at home for their toddler age children. This is when I love Montessori the most! It’s when I can share with others how lessons in a Montessori classroom can seem so simple in their design but carry with them a variety of creative possibilities and developmental benefits. Many of the materials for these activities could be in your home right now! These lessons are offered for children 18 months to 3 years old. Little ones at this stage are working on the development of their hands and are strongly attracted to order and exploring how objects work. These activities help to support growing fine motor skills and the development of concentration. When offering these lessons at home, remember less is more! Offer 2 or 3 of these activities and then rotate materials to keep the interest going. These lessons are best done when the child is seated at a table, but if you would like to provide the child with the option of working on the floor, offer a rug or floor mat so the child can have a designated work space. 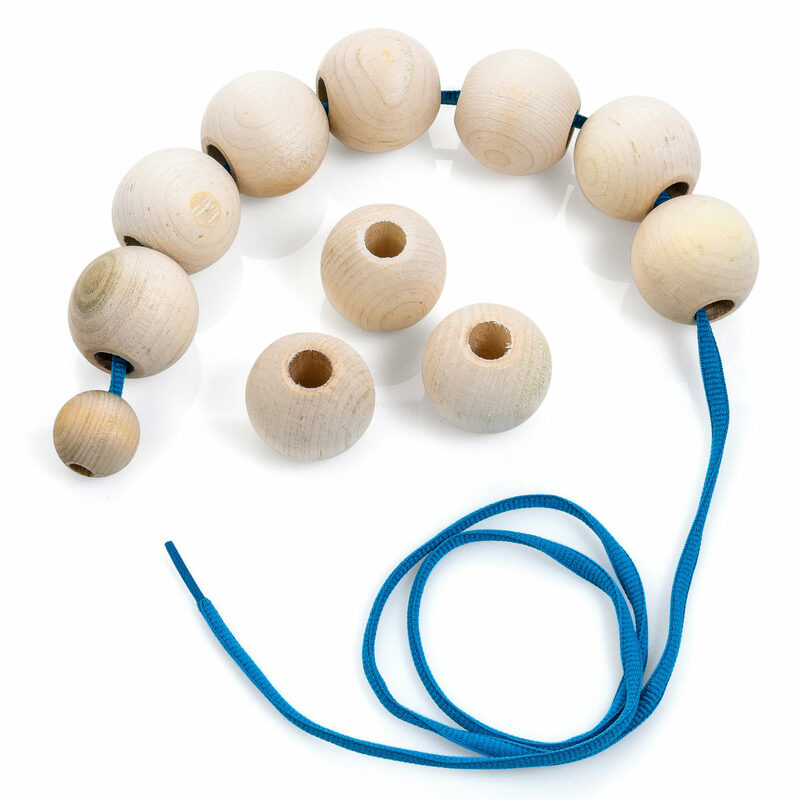 Beads on a string: Materials needed: Tray to hold the work, a small bowl to hold 6 to 8 large wooden beads with center holes, a shoe lace or cord no longer than 35 inches (90 cm) in length that can easily fit through the hole in each bead. The end of the string should be knotted or secured to prevent beads from falling off. Lock and key: Materials needed: Small tray or basket, padlock with designated key, string or thin cord to attach key to lock. Choose a lightweight padlock with a wide shackle width that unlocks with a single twist. For the young child, avoid small luggage locks and combination locks. Opening and closing containers: Materials needed: small tray or basket, 5 to 6 containers of different styles. You can offers jars, boxes, bottles or pouches that offer the child the opportunity to work with different closures such as zippers, snaps, twist top lids, Velcro or latches. For the young child, avoid any containers with small tops that could pose as a choking hazard. Opening and closing clips: Materials needed: 5 to 6 spring-type clothespins, bucket or bowl with a thin rim for the pins to be clipped upon. Look for standard laundry or craft clothespins. Avoid using mini pins or mini clips for this work. Coin box: Materials needed: small tray, container with a slit, small bowl to hold 8-10 large coins or large plastic chips. A “piggy bank” style money container can be used as long as the child can easily fit the large coins or chips through the slot and can easily remove the chips so the activity can be repeated. A clean and dry coffee canister or oatmeal container also make great coin boxes by cutting a slot through the plastic lid large enough to accommodate the coins. In addition to refining fine motor movement, these activities encourage a young child’s critical thinking skills and their growing mathematical mind. To introduce one of these lessons to your child, sit next to them and slowly present the activity taking care not to talk while your hands are moving. Once you have shown them how to do the activity, invite them to have a turn. Once the child has grasped the nature of the activity, walk away and allow them to work independently. When it looks like your child has finished working, show them how to put it away. If you see that the work is being mishandled in any way, you can step in and show the movements of the work again. If the materials continue to be misused, you can put it away and offer it again another day. Keep the lessons interesting by periodically refreshing the materials. Switch old containers with new, introduce a different lock, add different coins, change the style of clips or offer different sized beads. If your child really enjoys these lessons, we have more ideas coming in our next post so stay tuned for Part 2 on more Montessori inspired activities to make at home. We always want to hear from you! Use the comment sections below and share your thoughts with us. Be a part of Bella's Casa community for the best tips, and exclusive ways to start Montessori at home. Copyright@Since 2016 Bellascasa.com All rights are reserved.